This actually is a dessert which my family enjoys on those hot summer days. 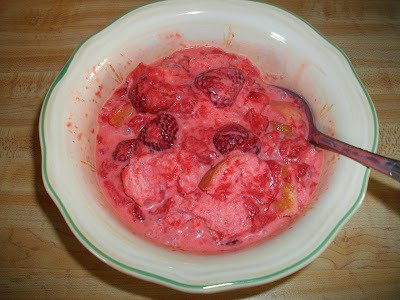 Just mix the thawed, frozen, sweetened strawberries with the cream, and served over torn pieces of white bread. In a large bowl, add the 3-1/2 lbs. (thawed) sweetened sliced strawberries. Stir in heavy cream until blended. Chill in the refrigerator 30 minutes to 1-2 hours. In serving bowls, add torn pieces of homemade, or store bought white bread. Pour desired amounts of the berry mixture over each bowl of bread. Note: If using your own frozen strawberries, you may need to add a bit more granulated sugar, but according to taste. Do this before adding the cream. The amount of strawberries and cream added; depends upon you. This sounds nice. Bet it would be good over pieces of angel food cake as well. We mainly serve it with the bread, as some of the bread soaks up the creamy strawberry liquid mixture. Our best time to enjoy this quick dessert is... when we have freshly picked corn-on-the-cob. The corn-on-the-cob and the berry bread make for a great meal.